EmailTray will help you manage several email accounts at once, including those based on Webmail, POP3 and IMAP. EmailTray will analyze your read/respond/delete/forward actions, as well as interconnections between email senders, to rank incoming emails by importance. EmailTray will notify you about new important emails with a pop-up ticker and sound - regardless of whether you have a browser or other email client opened. Passwords of your email accounts are stored encrypted on your PC. EmailTray will enrich your email communication with your contacts' information from their social profiles on Facebook and LinkedIn. "I'm very much impressed. 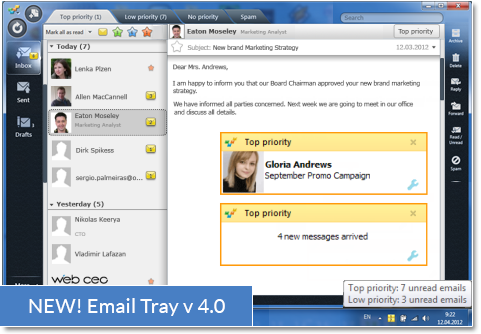 EmailTray is a smart up-to-date alternative to all of the existing email clients! No more distractions from work to check my mail - a colored tray icon instantly lets me know about the presence and priority of unread messages in any of my personal and corporate accounts. A great time saver - I highly recommend it!" Samuel O'Lander, CEO at MarketingSoul Inc.
EmailTray - a smart email client for Windows 7 / 8 /10 (XP/Vista also supported). Tracks all email accounts, ranks emails by importance and notifies only about important mail.